Jazz singer Joanna Dong has performed countless times, including at the finals of hit competition Sing! China. But at last Saturday's National Day Parade (NDP) rehearsal, her hands shook so much she was afraid she would drop the microphone. "I still feel a good amount of nerves going into this because it is the biggest platform that will be viewed by Singaporeans, specifically people I care about," said the 36-year-old at the Marina Bay Floating Platform yesterday. Dong, who will perform in the parade's show segment, said faltering on stage in front of people she would never run into at the coffee shop is not as scary. "But if I make a fool of myself at NDP, I would be very embarrassed to go eat at the hawker centre where I might be recognised. "So it matters to me that I do well in front of my countrymen," she said with a laugh. 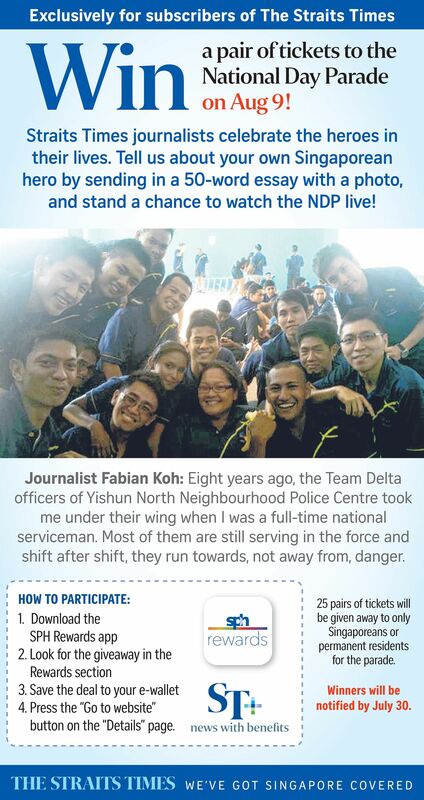 She was first approached to take part in NDP last November, and accepted without hesitation. "I got to sing at the Beijing National Stadium, and that is perhaps the biggest stage I will ever get to perform on. But the Floating Platform is the biggest for Singaporeans and that, in terms of how much it means to me, is way more monumental." She also likes that this year's NDP song is the classic We Are Singapore, which she has a part in. "I love that it's not a new song. "I think Singapore is sometimes very concerned with the new - we're constantly building new shiny things. But having now come into our own, I feel like we can look back at the past with fresh eyes." Though she attributes her fame and being a voice for Singapore on the international stage largely to Sing! China, Dong said she never intended to be a representative for the Republic. "When I first signed up for Sing! China, I just wanted to be recognised," she said, adding modestly that there are other Singapore jazz singers who are more talented. "Even now, I'm not sure if I'm really a successful singer. I mean, I'm popular or rather more well-known. But am I really successful? "I still don't know because there is no PSLE for singers," said Dong, who is married to theatre educator Zachary Ho. Still, she said: "I'm so glad I got to be part of NDP. There's no higher recognition in the nation."